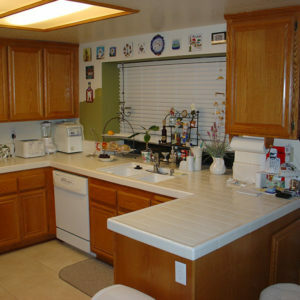 Don’t let the high cost of kitchen cabinet replacement stop you from getting the custom look you want for your kitchen. At Cabinet Magic, we can work with your budget to create a brand new look for your kitchen. How? Through the “magic” of cabinet refacing in Rowland Heights CA. What Is Cabinet Refacing in Rowland Heights CA? Cabinet refacing in Rowland Heights CA is a cabinet remodeling service that allows you to replace only what needs replacing for maximum visual impact: your cabinet doors, drawer fronts, and crown moldings. Other exposed exterior surfaces such as the outsides of corner or end cabinets can be covered with a material matching your new doors and drawers. Your new cabinet doors and drawer fronts will be custom made just for you, to suit whatever design constraints you may have. We can make any style of cabinet door or drawer front in your choice of woods. We also have a complete range of paint and stain options. When cabinet refacing in Rowland Heights CA is paired with new features like soft close hinges, lazy susans, and pull-out racks for deep cabinets, the result is cabinetry that looks and functions like new. It’s Convenient: Having your kitchen gutted to make way for new cabinets makes a big mess and can be a big inconvenience. Cabinet refacing is a much simpler, neater process that can typically be completed in just one day. Are you ready to make the kitchen of your dreams a reality with cabinet refacing in Rowland Heights CA? Cabinet Magic is here to help. We provide unparalleled customer service and craftsmanship to help ensure you will be totally satisfied with your new kitchen. Take the first step towards your new cabinets today by calling 800-828-4380 and requesting a free in home estimate.